L: 115" x W: 102" x H: 41"
Ian 6-pc. Sectional Sofa w/ 3 Power Recliners If you’re on the cutting edge of everything from technology to design, then you’ll love the Ian 6-piece sectional sofa. Chock full of power features such as power headrests, power reclining, USB ports and power lumbar, Ian has everything you need for ultimate, customized relaxation. Plus, cup holders in the console is an added bonus. With contrast topstitching, sloped track arms and the beautiful, on-trend charcoal upholstery, this sectional really has it all. If you’re on the cutting edge of everything from technology to design, then you’ll love the Ian 6-piece sectional sofa. Chock full of power features such as power headrests, power reclining, USB ports and power lumbar, Ian has everything you need for ultimate, customized relaxation. Plus, cup holders in the console is an added bonus. With contrast topstitching, sloped track arms and the beautiful, on-trend charcoal upholstery, this sectional really has it all. L: 13" x W: 40.5" x H: 41"
Couch is very comfortable. The fabric is well made. 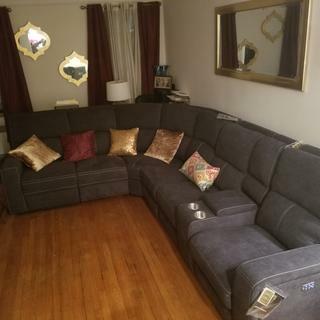 Can you add pieces to the sectional to make it bigger? BEST ANSWER: Hello Tara! Yes, additional pieces can be purchased for the Ian sectional. For assistance, please order through your local showroom or contact online sales at 866.383.4484, option 2! Yes but check the wedge for a neat job at the sides cause the manufacturer needs to put more padding. There is too much room which will stretch more eventually by using. Yes - you technically purchase each individually, so you can order the pieces that suit you, and just snap them together. Yes. We added a 7th piece to the sectional. It fits perfectly in our oversized living room. Yes. We added 2 pieces. Love it. How far from the wall does the Ian couch need to be placed due to the reclining? BEST ANSWER: Hello David, thank you for your interest in the Ian sectional! The pieces need to be placed at least 4" from the wall to fully recline. Can this be ordered with manual reclining? BEST ANSWER: Hello Tom, the Ian sectional collection does not offer manual recline.